At least 21 of the state and District of Columbia insurance commissioners have direct ties to the insurance industry on their resumes, which while guaranteeing knowledge of their subject also raises the question of how impartially they can regulate their former employers. The biographies, provided on the National Association of Insurers’ Commissioners website and compiled in this table by Repairer Driven News, show a variety of industry jobs. Some are distant links, like Nevada’s Scott Kipper having worked briefly as an agent before spending the rest of his career in government. Others have attained high rank at insurers or have owned their own agency, such as Maryland’s Al Redmer, who recently sold his to avoid a conflict of interest. Still others have held a prominent role in an insurance organization, like Delaware’s Karen Weldin Stewart, the founder of the International Association of Insurance Receivers, or South Carolina’s Ray Farmer, a former vice president of the American Insurance Association. We kept our tally conservative, not even counting those with indirect industry ties, such as the outgoing New Jersey Insurance Commissioner Ken Kobylowski and his potential successor, Richard J. Badolato, both of whom have been private practice attorneys representing insurers. We can’t say whether a commissioner is elected or appointed matters in a former insurance company employee reaching the commissioner role. Only two out of the 21 sitting commissioners with such ties were elected, but as only about a fifth of the 51 commissioners overall are elected anyway, so it doesn’t seem appropriate to draw any conclusions based on the small sample size. But, as judges must recuse themselves when regulating a company and body shop hopefuls running for the commissioner post make insurer donations to their opponents a campaign issue, we raised the question of if it is appropriate for an insurance commissioner to handle cases involving their former industry. For a neutral commissioner’s perspective, we contacted NAIC Vice President Sharon Clark, the commissioner of the Kentucky Department of Insurance. Clark has spent most of her career in state government, including serving as the first director of her agency’s Consumer Protection and Education Division. “It’s not unlike other parts of state government,” she said, giving the example of her husband, a member of the state transportation cabinet who’s worked in that industry. However, Clark also said her department hadn’t suffered from her lack of direct insurance industry employment. The potential for bias isn’t just something exclusive to commissioners with a reference from an insurance company, according to Clark. “Every day as regulators, we walk a fine line,” she said; both insurers and consumers deserve protection. “I don’t penalize them,” she said, though the employee must put their insurance license into escrow. She said their backgrounds actually can help protect consumers — former claims adjustors know the tricks the industry tries to use to save money. “It’s varied (the department’s staff), and I think that makes for a good mix,” she said. Examiners can’t investigate their former employers and there’s other standards as well for the department, she said, calling it “a little more stringent” in Kentucky. “I’ve raised that floor a little bit,” Clark said. She said only one employee was investigated internally in eight years, and it turned out to be “something minor” — a premium tax applied incorrectly, and not intentionally. “It would be very difficult for someone to really stack the deck,” she said. But we also put the question to Oklahoma Insurance Commissioner John Doak, a former Farmers agency owner and insurance executive — who has also released anti-steering public service announcement in December 2014 and in March challenged insurers’ “extraodinary denial rate” of Oklahoma earthquake claims, according to the Tulsa World. 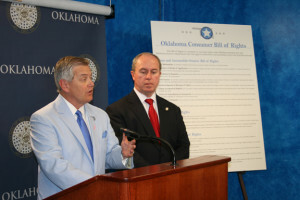 Doak, a Republican elected to the post, wrote in an email that having worked for an insurer was a nonissue — particularly as Oklahoma law required commissioners to have spent time as an insurer or regulator. He didn’t have any guidance for other commissioners who’ve worked for the industry before, arguing that there weren’t any conflicts. “We’re here to help and protect consumers,” he wrote. Doak gave a similar answer when asked about how he handles decisions about his former companies and colleagues or if he’s recused himself. Doak wrote that his past experience has “absolutely” helped with his current role. So far, there haven’t been any complaints from the industry, which “has always been receptive to our concerns,” according to Doak. However, one collision repairer, Gary Wano Jr. of G.W. and Son Auto Body, was more skeptical of Doak’s performance. Wano said that Doak had only done the anti-steering PSA after Republican state Attorney General Scott Pruitt raised the issue in November 2014 and wasn’t convinced steering was a legitimate problem. The video, according to Wano, was done to elicit consumer complaints to see if there even was an issue. “We don’t have the consumer pushing the buttons,” he said. Doak disputed Wano’s account of the agency’s interest in collision repair issues. “Despite the fact that my office has received very few consumer complaints about the steering issue, we have taken several actions to address their concerns,” Doak wrote. In November 2012, the agency mailed out nearly 650 posters to body shops reminding consumers they had the right to get a car repaired anywhere they wanted. Doak wrote that the agency was “doing all we can” for Wano’s concerns. Wano did agree that Doak has been much more responsive to repairer concerns than his predecessor. “He has given us more audience,” Wano said, noting that Doak is willing to take repairer meetings and return phone calls, and the agency “did spend some money” on the steering PSA. But Wano questioned the merit of having an insurance commissioner who has worked in the industry. “I think there are relationships that are built,” he said.